SCOTTSDALE, Ariz. – April 10, 2017 – The high energy of collector cars selling at No Reserve during Barrett-Jackson’s 15th year in Palm Beach helped drive the highest sell-through rate of any Florida collector car auction, including 14 world records as it was propelled by the unprecedented buying power of bidders from 48 states and seven countries. South Florida’s premier automotive lifestyle event was held April 6-8, 2017, at the South Florida Fairgrounds with charity sales reaching nearly $94 million to date with the sale of five vehicles. The three-day event featured 498 collector cars that sold for approximately $20.5 million in sales with a 99.4 percent sell-through rate. A total of 278 Automobilia lots sold for over $450,000, which is a 28 percent increase over last year’s Palm Beach event. The diversity of vehicles during the auction included some of the best examples of exotics, supercars, hot rods, classics and customs. Coming in as the auction’s top seller is a 2006 Ford GTX1 (Lot #706), a rare supercar that is one of less than 200 produced and sold for $401,500. A stunning 1962 Chevrolet Corvette LS3 Custom Convertible (Lot# 722) sold for $236,500 and a rare, original ’68 Ford Shelby GT500KR (Lot #718) owned by film star Lee Marvin earned a cool $220,000. One of the most popular cars was Dale Earnhardt’s #3 Goodwrench 1989 Chevrolet Lumina Race Car (Lot #648) that sold for $220,000. Barrett-Jackson achieved 14 new world sales records including a ’61 Volkswagen Deluxe Microbus (Lot #711) that sold for $291,500 and a ‘71 Chevrolet Custom K5 Blazer 4×4 (Lot #681) that brought $220,000. A pristine and heavily optioned original ’71 Oldsmobile 442 Convertible (Lot #691) sold for $176,000. A fan favorite, a ’60 Volkswagen Karmann Ghia (Lot #385), sold for $48,400 to thunderous applause from the auction crowd. Five charity cars raised the roof as they sold for a total of $515,000 (with an additional $10,000 donation by Michelle Mauzy and family), bringing Barrett-Jackson close to the $94 million mark in total funds raised for non-profits to date. A highlight was a ’96 Ford Mustang (Lot #3001) built by students at the Jordan Vocational High School in Georgia. Entrepreneur and collector car magnate John Staluppi and his wife Jeanette purchased it for $50,000. 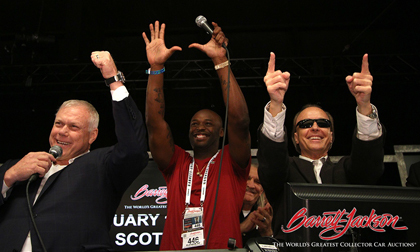 The Camaro was purchased by NASCAR Hall of Famer and renowned Chevrolet enthusiast Rick Hendrick, famous for his philanthropic gestures over the years like this one at Barrett-Jackson auctions. Consignments are now being accepted for the 2nd Annual Barrett-Jackson Northeast Auction at the Mohegan Sun Resort in Uncasville, Connecticut, which sold out last year at http://www.barrett-jackson.com/Consignment/Home/OpenRequest. For information on becoming a bidder, follow the link to www.barrett-jackson.com/bid.